Yesterday's tryouts got postponed a week thanks to rain, but I got in a good bit of baseball related activity this week. Wednesday I met up with Zach Behrens at the Sherman Oaks Castle Park cages, hitting several rounds and realizing that even batting is a workout when you haven't done it in a while. Saturday, though, was the real workout. Will Campbell and I met up at 10am at the Fletcher entrance to the river path, and proceeded to ride up the river and then across the valley to Sherman Oaks, roughly a 21-mile one-way from Downtown. We hit at Castle Park, grabbed a bite to eat, and then threw the ball around at Sherman Oaks Van Nuys Park. Final step was biking back across the valley to North Hollywood, where I grabbed the subway and Will continued on his two wheels. Biggest finding for me was that I seem to still be able to make a throw from home to second, though not with especially much on it at the moment. Rescheduled tryouts are this upcoming Sunday, so I'll know more where I'm at then. Sunday I go out to do something I've been wanting to do for a long time: play baseball. That morning I'll be heading out to tryouts for the Los Angeles Baseball League, an adult league that plays at fields scattered around the area. I last played in the summer of 2002, so I've got five and a half years of neglect to shake off my arm and bat before seeing what's still there. I'll be looking to play the Saturday wood bat league. 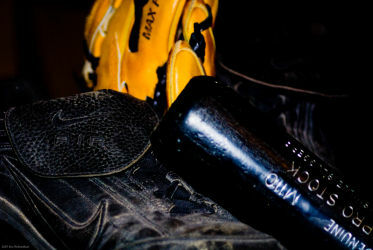 The last time I played wood bat I couldn't get hits to save my life. I'm hoping a new time in a new part of the country will give my luck there a little shake. 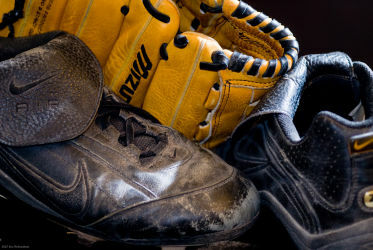 After all, back then it wasn't like I was always striking out -- it just seemed like every time I made a good connection it went straight into someone's glove. I've also managed to talk fellow IAAL-MAF member Will Campbell into coming out to tryouts. He and I are playing to hit the batting cages this week and see where we stand. I had to drop my new bike off at the shop today. 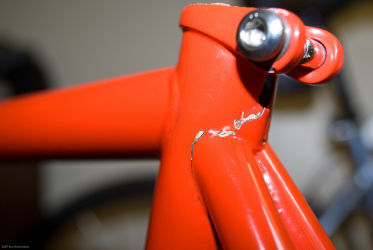 A crack had developed behind the seatpost, and spread along where the seatstay joins into the post. They'll ship the frame back up to Soma, who will presumably just send a new frame on back down. This means that my Devinci, neglected since December, looks to get a little use over the next few weeks. I'm a little curious to see what it feels like to get back on a freewheel after riding fixed for a few months.